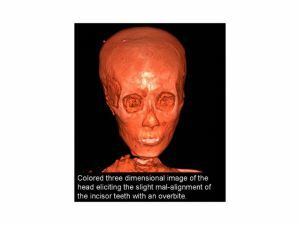 "While performing the CT scan of King Tut, we had several strange occurrences. The electricity suddenly went out, the CT scanner could not be started and a team member became ill. If we weren't scientists, we might have become believers in the Curse of the Pharaohs." By RSNA, [RxPG] Egyptian radiologists who performed the first-ever computed tomography (CT) evaluation of King Tutankhamun's mummy believe they have solved the mystery of how the ancient pharaoh died. A mishap during the mummification process, or even damage incurred during that first x-ray examination may explain the misplaced—and misleading—bone fragments. Dr. Selim suggests the damage may have been caused by the expedition led by Howard Carter that first discovered Tut's tomb in 1922. Publication: The CT images and results of their study were presented today at the annual meeting of the Radiological Society of North America (RSNA).